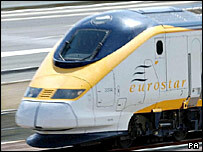 The economic case for the Channel Tunnel Rail Link "remains marginal", a report by MPs has said. The £5.2bn link from London to Kent cannot be justified on passenger numbers alone, said the House of Commons Public Accounts Committee. Regeneration benefits were needed to ensure value for money and taxpayers may be forced to pay more, MPs said. The second stage of the link from north Kent to St Pancras is due to be finished by next year. The link is expected to speed up journeys from London to Paris and Brussels, and improve services on domestic routes from 2009. The report also said the cost of the second stage may continue to be a problem for South East England as construction projects are hit by high inflation. Other major projects such as the Olympics in 2012, the widening of the M25 and the Thameslink 2000 rail scheme were also creating an extra drain on resources, the MPs added. The committee report said a forecast of passenger numbers had not been reached. London & Continental Railways, which bid for the project in 1996, said there would be 21.4 million Eurostar passengers by 2004, but the actual number then was only 7.3 million. The committee's chairman, Edward Leigh, said: "The CTRL is undoubtedly a magnificent project and a boost to our national prestige but the economic justification for it remains marginal. "No one really knows how much money taxpayers will be required to cough up in future." A spokesman for the Department for Transport said the link would provide substantial regeneration benefits. "In addition to improved passenger services, it will support an estimated 100,000 new jobs, 18,000 new homes and over 40 million sq ft of office space along the route of the link," he said.